Colonial Revival. 2 1/2-story, 3-bay hip-roofed frame house with projecting gable-roofed bays on south, east and west sides. Each has pedimented gable end and a Palladian window on attic story. 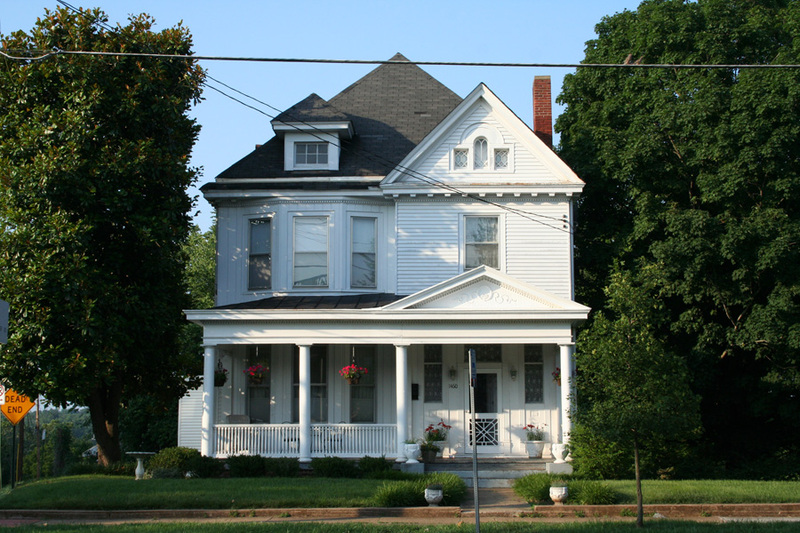 House features modillion and dentil cornice and 1-story porch with Doric columns, turned balusters and pedimented cross gable. 2-story polygonal bay is located on front facade. Transom and sidelights on front entrance. 1-story, shed-roofed attached garage is located at the rear of the house. Addition to rear in 1939. Built as a speculative house by the Citizens Building and Banking Improvement Company during a ten year period from 1892-1902. They built a small number of homes on Rivermont Avenue and Blackford Street. The house at 1460 was their largest and most expensive built. Other houses they built include 455 Rivermont Avenue, 1370 Rivermont Avenue, 1456 Rivermont Avenue and 1321 Rivermont Avenue. 1370, 1800, and 455 have all been significantly altered and 1321 was demolished in 1967. Both 1456 and 1800 are definitely known to be Frye houses, so more than likely 1460 was designed by him. 1460 was annexed into the city in 1900. The 1901 Land Book shows a house there, so it was probably built around 1898-1900. It was also owned by Rivermont Avenue Baptist Church from 1918 to 1962, and was used as their parsonage.